Shared knowledge, joint action, networking, self-organization and collaboration have found their way into art, culture, economy and politics. Through a global wave of artist-organized foundations and creative collectives since the mid-90s we’ve experienced collective work and life forms growing importance. While artistic collaboration has opened up new strategies affecting fields in science and society, we can read the latest trends and collectivization as a possible antidote to social patterns of isolation, insecurity and competition. We wonder to what extent projects like 37 are willing to contribute to an already existing network of people emphatically interested in the potential of critical collective art practices? 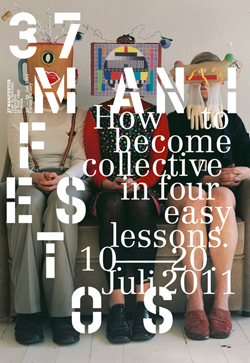 What are the inherit limitations of such a “manifesto”? At this point, it could be really useful to share syllabi on “how to collectivize” – is it “only natural”? case by case? regionally specific? practice-based? We couldn’t be more interested in that idea! Anyone interested is welcome to join the discussion this Tuesday – on Skype (skypename: ‘basekamp’) – or in person if you happen to be in Philadelphia (this week we’ll be meeting at Capagiro Cafe on 13th & Sansom Streets).